The curtain is a much overlooked decorating device that needs a little reviving. Because, frankly, where else can you hang a length of sumptuous fabric? Curtains provide textural interest to plainly painted walls and add a vertical dimension to a room - oh, and let's not forget, they help reduce the heat and bright light of a hot Australian summer. 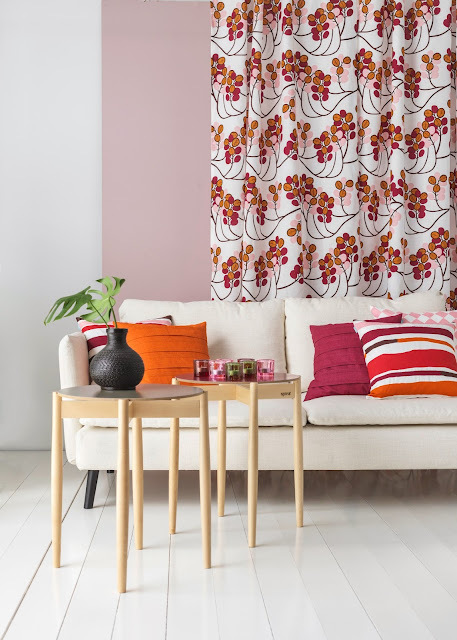 Pick up some of the colours of a curtain's fabric design in a few scatter cushions on a sofa and a sitting room is done. The new spring design below is from Swedish textile brand Spira and is available at Nordic Fusion, a Sydney Scandi import company which will open its warehouse this week at 122-126 Old Pittwater Road, Brookvale, from Thursday, October 17-19, for a massive three-day sale.